Glock handguns are known and used by the majority of professional, recreational and/or competitive shooters. They have been on the market since 1982 and what makes them so popular is basically their simple, but rugged construction and variable features, with a reasonable price tag and outstanding marketing. So along with your Glock, you need good, irreplaceable equipment that will close your performance on a high note. One of those essential tools is an attachable flashlight that helps identify the target (while also aiming through the weapon) in a substantially quicker and easier way at night, but also during day time. 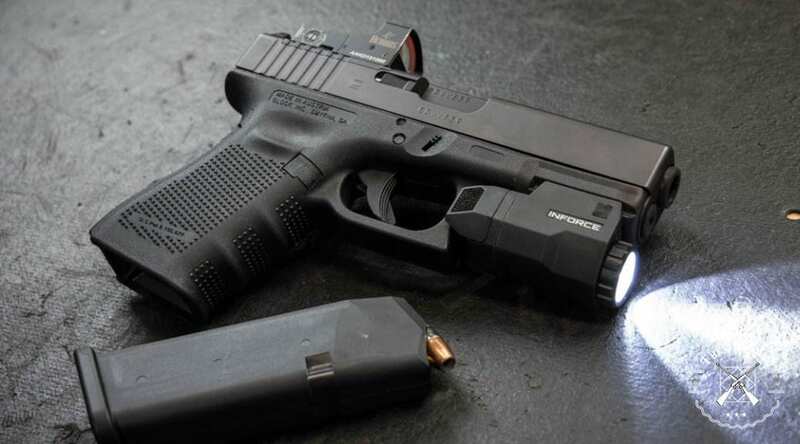 In this article, we will cover aspects like when and why you need a tactical light, what traits a good tac light should have, and all other perspectives to consider before buying a flashlight for your Glock. Maneuvering in the field or trying to take control in a confrontational, dangerous situation can be very demanding and requires a lot of preparation and proper instruments to ensure flawless reaction and protection. 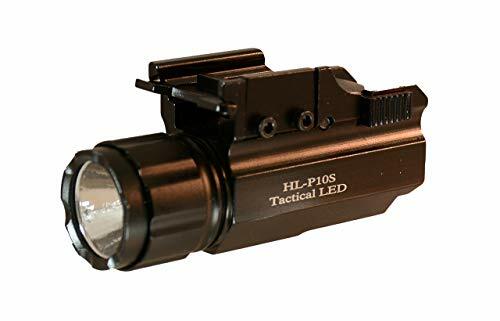 Most of us are not fans of, or do not have night goggles, so tactical lights are highly sought-after because, while adding slight, insignificant additional weight to your gun, they drastically enhance the search for an intruder/attacker in the dark and ensure dead-on targeting. Tactical lights are also diverse in intensity and spectral coverage with or without a laser. All of these characteristics create a custom tac light for all needs, specifications, and preferences. In addition, an attached tactical light frees both of your hands. Then, you can easily manipulate the gun in the area as you like, in comparison to mobile flashlights that occupy one of your hands and can obstruct your movement and focus. So, having a tactical light can only be an advantage to your night-time adventures or self-defense scenarios. Qualities that you need to look for when choosing a tac light for the Glock are reliability, lightweight construction, but powerful batteries, intense, high illumination, and shock-proof construction. The illuminating power you are looking for depends on the distances you are planning to practice or use your gun/tac light. High power light can blind the attacker, but at shorter ranges, it can simultaneously blind you too. This can especially arise in cases when you accidentally shine on a reflective surface, blinding yourself and thus, increasing the chances of losing and/or missing your target. An integrated laser is a secondary, immensely helpful feature that guarantees spot-on target acquisition. It often means higher cost of the product, but definitely ensures more protection and better usage of your ammunition and time. A tighter or a wider light beam can make a huge difference and depends on what you are mainly using the tactical light for and at what locations. You will probably need wider coverage and a secure peripheral view when shooting outdoors, while a sharper and intense, but tighter beam, is necessary indoors. Other great features a tactical light may have are multiple, different lens colors, different light patterns, but what is most important is that it suits the needs of your particular vision and preferences, as well as the work you intend to do with it. The personal preferences may vary from the size of the light, construction, durability and ruggedness, frequency of use, incandescent or LED light, etc. So you need to test the light and its effectiveness in your own hands. However, when purchasing online, that is not always possible. Fortunately, with widespread tutorials, reviews like this one, testimonials, and other internet resources, you can get a quite objective assessment on how your favorite tac light feels and how effective it is in a variety of situations. We have written this review to save you from having to research on your own, skimming through hundreds of possibilities and products that will take a significant amount of your time and energy. Here, we have chosen the top five tactical lights on the market for the Glock and have summed up their advantages and disadvantages. Check out these recommendations to help narrow down the choices for your tac light. Streamline is among the best selling brands of tactical flashlights and they astound us with this product again. 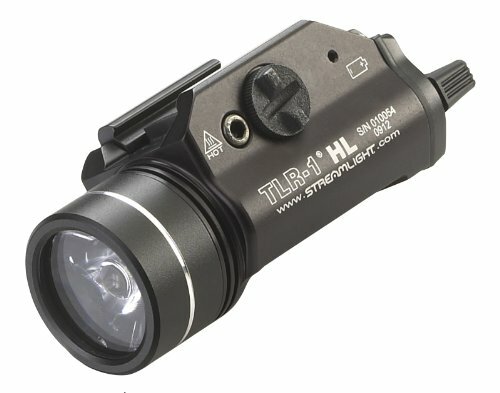 This compact, lightweight, waterproof, high temperature-bearing flashlight (up to 120°F) is incomparable when it comes to its great all-around features, like being 800 lumens wide with super bright illumination, shock-proof LED technology, ambidextrous momentary on and off switch, and user programmable strobe activated by a double press on the momentary paddle. With a little practice, any gun enthusiast with quickly and easily be able to operate this flashlight. This flashlight is a true spotlight, blinding the attacker in an instant and disorienting anyone in the vicinity. It is very easily used and maneuvered and clamps onto almost all rail types with the respective keys included in the package. The machined aircraft aluminum construction and anodized finish, together with the glass lens, are resistant to all sorts of impact, shock, and weather conditions. If you have a proper grip on your pistol, this tactical light doesn’t touch the muzzle, so it holds up the recoil very well. The light can also go through thousands of plinking rounds with no damage or malfunction whatsoever. If you want to feel like a true marksman, or are one already, this is the light to get. It is so bright that you can’t even put fingers near the reflector without getting burned. We start with a high illumination light because we want to impress and remind you how valuable these items are. So, keep reading, but know this is a good option for a high-grade, 800 Lumens Streamlight flashlight. If you're looking for something more affordable, yet versatile and reliable, we suggest you look at this Aimkon tac light, supporting not only Glock models, but many other pistol brands as well. It features a 500 lumens, quality LED beam with an easy-to-use strobe function. The strongest light setting provides a flare that will block all further movement of an intruder, blinding him to "paralysis" and giving you the opportunity to shield yourself perfectly, attack properly, and/or drive him/her out in a matter of moments. You can also rely on the highly effective strobe function that is turned on with a rapid switch. The instructions for use are included in the package and are easy to interpret and apply. Regarding the construction, the compact, weather-proof design of this flashlight will endure all natural or induced conditions and circumstances and accompany you in all planned and/or unexpected events. It can go through hundreds of rounds with no damage or malfunction whatsoever. You can remove it and attach it to different firearms without concern of it breaking. It will work well during harsh conditions, unintended treatment, and in unexpected circumstances. Mounting is compatible with almost all pistols that have a Picatinny rail mount and requires no additional tools for assembly. Aimkon stands behind their products and has an excellent customer support system on call and in service at any time. The company is very professional, from design to teamwork. We highly recommend them and hope to increase their client base, since this product is in high demand and won’t disappoint new or seasoned customers. Although this Streamlight flashlight seems less bright than others (featuring only 125 Lumens), it does light up and reaches further distances, besides assisting in intense close-up confrontations. The concentrated beam is wide enough to ensure positive and optimal capture of a surface, whether looking for something in the dark or aiming at a target. It projects a blindingly bright circle and becomes very useful and efficient in pitch dark circumstances and places, followed by a dead-on shot. It has a rugged construction with a black anodized finish and meritable, high-end features and components, like the ones mentioned below. It only requires one CR2 battery included in the package and lasts for 1.5 hours of uninterrupted work, even with both the light and the laser turned on. You can switch it on or off with your left or right hand, on both momentary and constant LED illumination, depending on your needs and preferences at the moment. 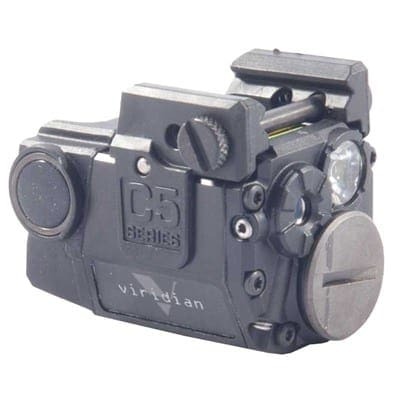 It features an integrated 640-660nm red laser that could be used for as long as 11 hours and reliably retains zero thanks to the solid elevation and windage screws. It excels in long-range target acquisition and mostly helps in low-light conditions. 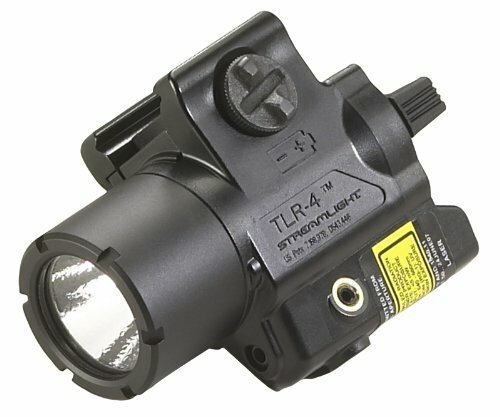 This tactical light is very good, sufficiently bright, and durable. Its size is perfect, extending out the muzzle very little and fitting almost all handguns. Maintenance is easy, just clean the lens on the light and laser to remove residue after each use and you'll have it for the rest of your life. Streamlight once again offers a great product of unbeatable quality at an affordable price. That's why we recommend it with full confidence. In this combo, you get an impact-resistant tactical light with a green dot laser that adjusts to the needs of the eye better than a red one at brighter conditions. It features 100 lumens technology that is very bright, given how small and lightweight this tactical light is. It fits perfectly between the trigger and the muzzle, lying parallel to the barrel with no obstructions or overhang whatsoever on any handgun. Thanks to that, with this flashlight, it's incredibly easy to conceal, carry, draw, and re-holster. The laser reaches up to 200 yards in the daytime and is activated immediately after grip and draw with the help of the Instant-On system. You are free from handling buttons and switches (for the laser), so it is tremendously convenient when an immediate reaction is necessary for risky situations. It features a great strobe function containing multiple pulsing modes and even stronger brightness so you can effectively disorient the attacker and remain safe. It runs on a single CR2 3-volt lithium battery, giving 4+ hours of constant laser use, 7+ hours when pulsing and one hour of tac light and laser combined. The package includes two mounting screws and the installation process is easy and quick, sliding onto tactical, standard Picatinny rails. With this flashlight, you won't miss your target, especially in daylight operations and self-defense. The green laser is unique and impressively bright like no other. We fully recommend this light and reassure future owners of its high accuracy and dependability. With its numerous high-quality features and components, it is an unmatched item, totally worth the price for your flashlight collection. Our last but not the least tactical light in this review is the third Streamlight tac light to appear on our list. This one features a red laser for long-range targeting and an optimized, but very powerful, shaft of light and peripheral illumination. The LED light shines on 100 Lumens and the beam pierces through 89 meters (97yds). The laser can continuously shine for 11 hours by itself, while continuous use with the LED and laser combined is around one hour. 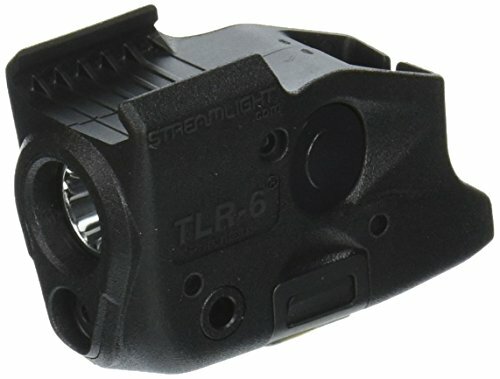 Like the rest of Streamlight’s tac lights, this one also knocks it out of the park with durable, high-grade polymer construction, and an equally impact-resistant glass lens. The light can stay attached to the gun while removing and replacing the battery, with no tools whatsoever, allowing the unit to hold zero while sighted-in throughout the whole process. The mounting requires only the Glock rail mounts on standard and compact handguns, sliding and attaching securely to the rail and trigger guard of the weapon. The elevation and windage adjustment screw holds zero after long plinking or shooting numerous rounds. It is ergonomically built to be easily accessible and manageable in all hazardous or tricky situations, and also importantly, doesn't stick out from the muzzle at all. This tac light is small but tough, and will never let you down on the range. There is no wiggle after proper installation and remains solidly attached, low-profile, and satisfyingly bright. The ergonomically placed buttons allow for overall easy operation and manipulation and a powerful infrared dot. For the properties it offers and the price point, it is surprisingly affordable. Therefore, we finish with this light and unquestionably recommend it too. Whether for recreational, home-defense, or tactical use, a good tac light will support your Glock pistol and improve your aim, speed, and make night chases easy, admirable and even exciting. It is also a great and very effective companion tool. All of the models we reviewed easily slide on and lock onto the Glock pistols like they were custom made. Don’t be overly concerned with the tac light you choose, since if you choose one from our list, the results will speak for themselves. 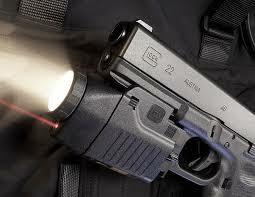 You only benefit by reinforcing your Glock with the proper gear, like a great tactical light for flawless night moves.